If you are still unsure about where to stay, give us a phone call now! The most popular villa destination in Bali is Seminyak with its world-class restaurants, hype cafes, creators' boutiques and famous beach all within walking distance from your villa. For those looking for more affordable villas within 10 minutes drive from Seminyak, we recommend Legian, Canggu, Kerobokan or Umalas. 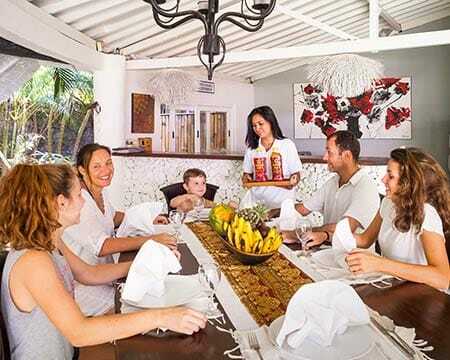 If your main focus are white sand beach and unique surf spots then we recommend booking a villa in the Bukit Peninsula, and especially in Uluwatu. If all you want are yoga classes, organic food, culture and nature, then Ubud is for you. Finally, if you dream to be far from everything, book a villa in East Bali or North Bali. Bali is small enough that you can choose to stay in one part of the island and see most of its wonders with a few day trips. Alternatively you can contact our villa consultants now to get a tailored-made program of successive villas in different parts of the island to discover its different faces: the hype Seminyak, the laid-back Amed in the East or Pemuteran in the North, and finally a villa in Ubud to be close to the temples, jungle and rice paddies.